Fiction Lovers 2018: Go Big! Friday’s Bacon featured a year’s worth of nonfiction reads for 2018. Today’s post offers only one recommendation for fiction readers: if you haven’t devoted yourself to a big brick of a novel lately – one that could be used as a doorstop or weapon – make this the year! I just finished Haruki Murakami’s 1Q84 and might open an extra bottle of champagne. I’ve been dragging this 1000-pager around in my purse for some time now – I know, a Kindle would be lighter – and I’ve got that delirious mixture of happiness and sorrow that comes when you finish something Big. So, one reason to read a doorstopper is this: a real sense of accomplishment. You also don’t have to think about what to read next for a long time. The question of “what to read next” can be anxiety-inducing. A big book invites you to stay awhile and not worry about tomorrow. Another reason to pick up a giant tome is to impress your (young) nieces and nephews when they see you reading it. This really happens. You probably won’t impress your teenage kids or your spouse. The best reason to go big? Full immersion, Southern Baptist style. Again, I’m speaking from experience here. You’re committed when you’re fully clothed and fully wet. And when you’re 600-plus pages into a book, you’re in deep. 1Q84 is a literary fantasy, a dystopia of sorts, but it’s also firmly rooted in the year 1984 in the city of Tokyo. The year 1Q84 is a parallel reality in another Tokyo where several characters find themselves trapped. To reduce 1000 pages to a sentence – 1Q84 is a love story. The lovers are hiding and hidden from each other while otherworldly danger stalks them. 1Q84 dwells on and illuminates the yearnings of the heart of its central characters, Tengo and Aomame. But it’s also about parents and children and how they can hurt and heal each other; Tokyo traffic and Tokyo loneliness; the consolations of friendship and kind strangers; and how people make sense of themselves. Among other things. IQ84 had a particularly mesmerizing immersive quality. Murakami’s sentences are lulling and sometimes repetitive. If he tells you something once, he might tell you twenty times. But over the course of 1000 pages, his prose starts to feel like the lapping of waves. You’re on a raft, on the ocean. You don’t really want to reach shore. What’s your favorite big novel ever? Please let us all know in the comments! My favorite big book (well, semi-big book) of all time is Matterhorn, by Karl Marlantes. I gave it to my father in 2010 when it first came out. My dad served as a Marine in Vietnam and left the service after seven years to start his own business. He is sometimes a man of few words. “It’s a good book, you should read it,” he said, sending it to me by UPS immediately after finishing it. That gesture – and his words – were meaningful. Since then, I’ve given it as a gift and recommended it more times than I can remember. 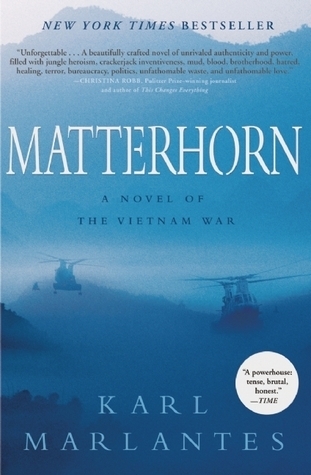 Marlantes himself served in Vietnam and spent decades working on this novel about imperfect decisions; why men fight; love; heroism; race; despair; and the things that can possibly give us hope. Every war novel must at some point confront a central contradiction. Only the truth has any real value, but the truth about war is that it contains nearly unbearable levels of repetition, boredom and meaninglessness. To write honestly about war, you should make readers feel they have endured those things as well. Yet no sane novelist wants to inflict that much discomfort on the audience. And so we read novels (and watch movies) filled with the kind of bravery and drama that make war look at least entertaining, if not admirable. Many of those works are tremendous artistic achievements. But they’re not war. Karl Marlantes’s first novel, “Matterhorn,” is about a company of Marines who build, abandon and retake an outpost on a remote hilltop in Vietnam. According to the publisher, Marlantes ­— a highly decorated Vietnam vet — spent 30 years writing this book. It was originally 1,600 pages long; now it is 600. Reading his account of the bloody folly surrounding the Matterhorn outpost, you get the feeling Marlantes is not overly worried about the attention span of his readers; you get the feeling he was not desperate or impatient to be published. Rather, he seems like a man whose life was radically altered by war, and who now wants to pass along the favor. And with a desperate fury, he does. Chapter after chapter, battle after battle, Marlantes pushes you through what may be one of the most profound and devastating novels ever to come out of Vietnam — or any war. It’s not a book so much as a deployment, and you will not return unaltered. A friend at a holiday party recommended Seveneves, by Neal Stephenson. “I read it about a year ago. One section dragged on and on and was not as well written. But I keep thinking about it even a year later,” Jennifer Frist remarked. 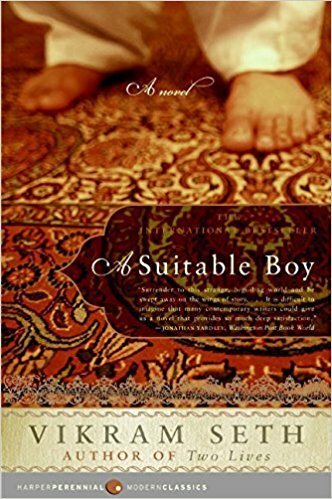 A Suitable Boy, by Vikram Seth, caught my eye. Leta and her mother, Rupa Mehra, are both on a similar mission to find Leta a suitable boy to marry. Set in the 1950s against a newly independent India, this is a complex story of ordinary people during an extraordinary time. While you must read to the end to find out what Leta’s future holds, it’s an engaging book that keeps you interested throughout its 1,474 pages with rich backstory and cultural events. Lithub offers an excellent roundup of “Really, Really Big Books” that includes some delicious surprises, especially coming from the highbrow epicenter of the literary u-verse. Most intriguing to me – God is an Englishman, by R.F. Delderfield. The Swann Family Saga, comprising God Is An Englishman, Give Us This Day and Theirs Was the Kingdom (a mere 2,000+ pages, all three), follows Adam Swann and his progeny from The Raj to Victorian London and on to the first stirrings of The Great War. In other words, Downton Abbey fans, do apply. There’s no chance I’ll get to all the books I want to read this year. Just reading the lists is making me anxious. That’s the best reason of all to quit looking at lists and – you know – pick up a book. Breaking news! This looks great! Just sent by regular Bacon contributor Sara Bhatia…. I love what you wrote about sharing Matterhorn with your dad, Jennifer. The juxtaposition of your spare exchange with the expansiveness of the novel was beautiful. And my favorite long book is Anna Karenina. Cheers to the new books we’ll discover in the new year and thank you for giving us platform for sharing and discussing them! “Harlot’s Ghost: A Novel of the CIA” by Norman Mailer. 1300 pages. The final three words are perhaps the most obnoxious in American literature: “To be continued…” It didn’t, but still a fascinating, monumental work. Harlot’s Ghost was the first “big” book I ever read (in my 20’s). I had such a sense of accomplishment after I finished it, and parts of it have stuck with me ever since. I’ve considered re-reading it, to see how time and life experience may have changed my perspective, but haven’t the motivation just yet. I’ve also found that an audio book is a good way to consume really lengthy novels. I listened to “Unbroken” as we drove across the country several years ago. Another favorite. I loved Middlemarch – a big, winter-by-the-fire read. Am now hoping to finish Auster’s gorgeous “4321” finally(!) before the new year – it’s amazing and definitely long (866 pages). I’ve loved every detailed minute! Middlemarch keeps showing up on all of the “Best of Big Books” lists! I’m so glad to know that you enjoyed it, and also Auster’s 4321! Oh dear, more for my list. xo! You need to get those big books on a Paperwhite! I worry for your shoulders with that thing in your purse ha ha. Anyway, just wanted to pop over and say thanks for the list of good bigger books. I actually noticed this year that I became a wee bit too obsessed with reading as many books as I could, which made me more hesitant to get sucked into a fat juicy book. I have such fond memories of being completely immersed in Pillars of the Earth a few years ago! I want to remedy this this year.